It's that time of year. The biggest holidays are coming up soon, and we'd like to give the gift of holiday food pronunciation. When you're at the dinner table for Thanksgiving, how will you ask for piece of pecan pie? We created a pecan polling question equipped with sound to find that out. We came up with five potential pronunciations for the festive nut. We like to think we have all of our bases covered, but feel free to let us know if you pronounce it a different way. Congratulations to ebrenner for winning the City Dictionary "Spooky City" Contest. Her More weight entry exemplified the spookiness that defines Salem, Massachusetts. 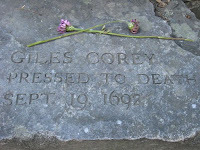 The poor Giles Corey, accused of being a warlock, refused to enter a plea so he could be tried for his alleged crime. He was subsequently "tortured by the authorities, who laid a heavy board on top of him and placed large stones on the board." Every time his torturers asked for a plea, "more weight" was the only response he would give. He eventually was crushed by the sheer weight of the stones. Pretty spooky, huh? Of course, Salem is no stranger to spookiness. The Salem Witch Trials (Wikipedia) are an infamous part of US history. Salem is known as the "Witch City", which is also an entry authored by ebrenner. Again, thanks and congratulations to ebrenner!